For years, public radio listeners around the country have celebrated “Thanksgiving with Cantus” with American Public Media. 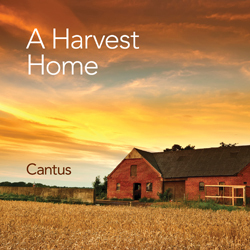 This fall, Cantus releases a recording of beloved songs celebrating the joy of the holiday. A Harvest Home includes original arrangements of favorite hymns, American folk tunes as well as new compositions by Ysaye Barnwell, Byron Adams and pieces by Edvard Grieg, Felix Mendelssohn and Randall Thompson.